Rainbow trout flesh can be white, pink, or orange and has a delicate almost nutty flavor. “Pink” rainbow trout, which are sometimes marketed at a premium price (and preferred by European consumers compared to U.S. consumers that show preference for a whiter fish), get their meat color from a synthetic carotenoid pigment that is added to the fish feed. Rainbow trout are available year-round primarily fresh, although it is also available frozen, smoked, and canned. Product forms include whole dressed trout, boned trout, skin-on pinbone-in fillets, & skin-on boneless fillets. Look for fish with moist flesh, shiny skin and eyes, and a fresh, mild aroma. According to some buyers, raceway-raised fish tends to have more consistent quality, but tend to be smaller in size (~1-2lbs). Trout from ponds/net pens grow faster and are larger (~5-10lbs), but if the water isn't managed properly the fish may have an off flavor caused by algae. Buyer Beware: Some rainbow trout farmers add antibiotics to their feed so buyers who are concerned about this are advised to look for regional farmers who don’t use animal-based feeds, and limit or entirely avoid the use of antibiotics. In the wild, rainbow trout live between four and six years, and can live up to 11 years. They usually grow between 20 to 30 inches in length (51 to 76 cm), and weigh up to eight pounds; however, some can grow up to four feet in length (1.2 m) and weigh up to 53 pounds. Lake and ocean-dwelling rainbow trout, known as steelhead trout, grow larger than freshwater stream stocks. Their coloring depends on habitat, age, and spawning condition; they are usually blue-green to yellow-green, with pink stripes along their side, and small black spots on their back and fins, while steelheads are named for their steel-grey coloring on their head. Also called redband trout, rainbow trout are a member of the salmon family. 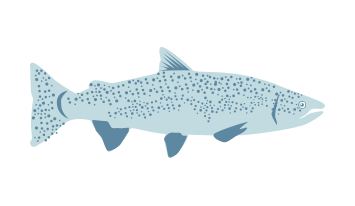 Spawning season is usually between January and June in the north, and September to November in the south, happening between three and fours years old. Steelhead are anadromous and return to their original hatching grounds in freshwater streams to spawn. Females build nests, called redds, in the gravel river bottom. They produce between 2000 and 3000 eggs per kilogram of weight. Eggs fall into the redds, where the males fertilize them. They hatch within seven weeks, and in two weeks the yolk sac is completely consumed and the fry begin feeding on zooplankton. As fry grow, they develop parr marks – dark vertical bars - on their sides. These juveniles are called fingerlings because they are roughly the size of a human finger. Juveniles remain in the river for up to three years before undergoing physiological changes, known as smoltification, which allow them to survive in seawater. Offspring of steelhead are not always anadromous, just as offspring of rainbow trout do not always remain in freshwater rivers. Populations can spawn multiple times in a lifetime. Rainbow trout feed on aquatic and terrestrial insects, as well as fish and fish eggs and small crustaceans. Spawning salmon attract rainbow trout, which eat their eggs. Steelheads feed primarily on other fish, squid, and amphipods. Predators include lampreys, fish, birds, bears, river otters, seals, sea lions, and orcas. Rainbow trout are native to the Pacific drainages of North America with their historic distribution extending from Alaska to Mexico including British Columbia, Oregon, Washington, California, Idaho, and Nevada. Their current distribution now covers most of North America and many other parts of the world. In the US, state and federal run stocking programs are responsible for the introduction of rainbow trout outside of their native range and the translocation of different strains of rainbow trout within their native range. Rainbow trout are found in cold, clean, and clear streams, rivers, creeks, and lakes. Steelhead, a type of rainbow trout, will inhabit estuaries and the ocean for much of their life and will return to freshwater to spawn. Rainbow trout prefer complex stream and riverine habitats that consist of riffles, pools, submerged wood, an array of aquatic and riparian vegetation (for shade), large rocks and boulders, and undercut banks. Spawning occurs in main river channels and tributaries and in inlets our outlets of streams and lakes in the spring or early summer months. Rainbow trout prefer to spawn in waters with temperatures exceeding 42 to 44 degrees Fahrenheit (5.5 to 6.7 degrees Celsius). During spawning, females will dig a depression on the water bottom (called a redd) where she will deposit a portion of her eggs. Fertilized eggs are then covered by gravel. Riffle and pool tail-outs with gravel that are free of sediment are ideal spawning habitats for rainbow trout. The Canadian Fisheries and Oceans Aquaculture R&D division conducts trout aquaculture studies to increase human understanding about the species, farming production methods, effect of trout farming on lake ecosystems, feed composition, and waste management. They are also investigating the changes made to one lake at the Experimental Lakes Area near Kenora, Ontario due to the establishment of a small-scale rainbow trout farm. Fisheries biologists from the Grand Mesa, Uncompahgre, and Gunnison National Forests (GMUG) assessed the biology and population status of rainbow trout in the GMUG Forests in 2008 to summarize past and present publications, providing an objective overview of the status of the species. Limited funds restricted their access to collect a full inventory and monitoring across the landscape. Past studies have focused on native species, therefore not identifying the exact distribution and abundance of rainbow trout populations in the GMUG Forests. Permanent sampling sites and long term monitoring will provide the most accurate description of rainbow trout populations in the area. Gaining a better understanding of rainbow trout habitat requirements, locations of fish barriers, and overall stream conditions will help with managing fisheries resources in maintaining existing rainbow trout populations while meeting Forest Plan standards to protect native fish. Oregon State University found in 2011 that the health of wild steelhead populations rely on freshwater rainbow trout productivity. Based on a 15-year analysis of over 12,000 steelhead trout, researchers found that up to 40 percent of the genes in returning steelhead came from rainbow trout. Rainbow trout act as a genetic reservoir for when ocean conditions are unfavorable to steelhead survival. The offspring of rainbow trout may migrate to the ocean, and return as a larger, more robust steelhead. The results raise challenges for fishery managers to include the health, stability, and habitat of freshwater rainbow trout in their assessments. Scientists are unclear as to why certain rainbow trout remain in the streams while others become anadromous. Based on a study published in 2014 in the Canadian Journal of Fisheries and Aquatic Sciences, they hypothesize that it has to do with the conditions of the individual fish’s size and behavioral tactics, as well as gender, as males more frequently remain in streams while females more frequently become anadromous. Although they found a number of correlations, the scientists suggest studying the effects of water temperature, impact of food supply, the cost of freshwater migration and marine survival, and the effects of overcrowding to better understand the metamorphose. Direct tests are scarce, and little data exists on the extent of residency and anadromy. Data gaps were identified for future research. The practice of raising trout in the US began in the late 1800s, with an interest in raising the fish for both recreational purposes as well as for commercial food production. Commercial food production grew rapidly beginning in the 1960s and it is now one of the largest aquaculture industries in the US. Rainbow trout are farmed in flow-through systems consisting of raceways, ponds, and tanks using well, spring, or stream water. They are also farmed using recirculating and net pen systems. The majority of US trout farms occur in Idaho and vary in production size from a few thousand pounds to millions of pounds of trout a year. In the US, both federal and state agencies regulate aquaculture production and numerous state permits (that vary pending on the state) are required in order to operate a rainbow trout farm. Under the Environmental Protection Agency’s effluent guidelines any facility that produces over 100,000 pounds of fish must develop a best management practices (BMPs) plan to address waste discharge and for meeting effluent requirements. BMPs must be tailored to each facility so that plans are developed with site-specific variables in mind. All BMPs plans are developed by the facility and must be approved by the EPA. Additionally, individual states may have specific effluent and waste guidelines as well. In Idaho, permits specify the average monthly and maximum daily total suspended solid limits. Any facility in Idaho, that produces more than 20,000 pounds of trout must have a National Pollution Discharge Elimination Systems (NPDES) permit to control and monitor their discharge levels of solids. Idaho-based facilities must also develop and follow best management practices under the Idaho Waste Management Guidelines for Aquaculture Operations. Water quality regulations in the areas where trout are farmed in the U.S. are robust, and monitoring is consistently performed. In the United States, the Environmental Protection Agency manages effluent from trout farming operations. In addition, Idaho has agencies that enforcing water quality limits at the state level. Rainbow trout farmed in the United States primarily comes from Idaho, where they tend to be raised in concrete raceways that are like artificial streams. These freshwater flow-through systems filter out waste products and discharge treated or partially treated water into streams and lakes nearby. The discharged water can contain an overabundance of nutrients that affect local water quality, producing more algae, according to the New England Aquarium. Regulations are in place to monitor water quality in the United States so this doesn’t become a problem. Rainbow trout are also raised in floating cages in both salt and fresh water to larger sizes of 6 pounds and up. This fish is usually marketed as steelhead in North America and as "salmon-trout" in other countries. This method, which is found mainly in Norway and Chile, but also in the U.S. and Canada, is high-risk due to the increased likelihood of pollution getting into local waterways. Most rainbow trout farms in Idaho have protective netting that keeps birds away from the fish without harming them. Although most trout farms divert fresh, clean water from local waterways into raceways and farms, there is no evidence this depletes groundwater. Rainbow trout eat feed that contains a relatively large amount of fishmeal and fish oil. The Monterey Bay Aquarium points out that trout are fairly efficient at converting their feed into protein, though. Recent innovations in rainbow trout feed enable the fish to digest the food even more efficiently as well. University of Idaho researchers are trying to figure out a way to replace fishmeal and oil entirely with the byproducts of grain and ethanol production. In Colorado, where the fish are raised in ponds, there have been outbreaks of a pathogen that leads to a condition called Whirling disease, so the state regulates that trout farms there must be certified as being free from the disease. There is no evidence of rainbow trout escaping from farms in Idaho, where the majority of the fish is raised in the United States. Since the species is native to the Pacific Northwest, even if trout did escape, the impact in Idaho is likely to be minimal, the Institute added.